How to Achieve Ultra Vibrant Coloured Macarons. Growing up my sister and I always got a sugar egg from my parents for Easter. 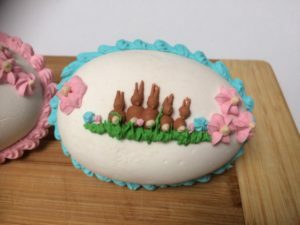 Sugar eggs don’t seem to be as commonplace anymore, so I was thrilled when I learned how to make them at a local cake club meeting. I have learned a lot through meetings and workshops at The Cake Decorators’ Association of WA. They have hit the sweet spot with innovating and developing, sharing new techniques while keeping traditional techniques and skills alive where appropriate. 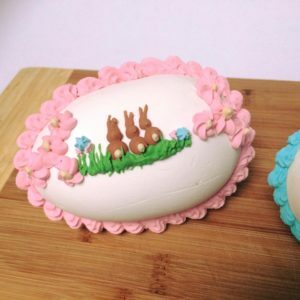 Candy icing can be used for more than making just sugar eggs. It’s super strong and once it’s dried it’s quite resistant to humidity. It can be used to make structural elements like walls, sugar bridges, and any kind of tall or long thin decorative sugar work. It can also be used as internal support for more delicate decorations. It sets pretty quickly and sets super hard. Dried pieces can be joined with royal icing and some very impressive sugar structures can be made with it. The candy texture is even pretty pleasant to eat, especially if it has been flavoured with edible essential oil flavourings like musk, peppermint, lemon, rose or any of the now massive range of flavoured oils available or candy making. 2-3 drops flavoured essential oil or essence (musk, aniseed, and peppermint are my favourites). Sift the icing sugar and set aside. Bloom gelatine in the water by mixing them together and leaving them to sit for 5 minutes. Add glucose to gelatine mix and microwave until melted. Microwave in 10-second bursts mixing between bursts until the gelatine is melted. Do not overheat or allow the mixture to boil or it will adversely affect the gelatine and make a lumpy mixture. Gradually mix the syrup/gelatine into the sifted icing sugar. Knead well. Dust bench with icing sugar to aid kneading. Knead until no longer sticky, add a little more sugar as necessary. A thin smear of Crisco or Copha on the bench can aid with kneading, but too much can make the icing too brittle once it dries or make it dry too slowly. Add flavouring, some of the flavoured essential oils are surprisingly strong, it’s easy to add more but can be overpowering if you add too much. Start with two drops, knead them in, let sit for 15 minutes then taste, add more flavour if needed. Wrap and let rest at least 15 mins before using. 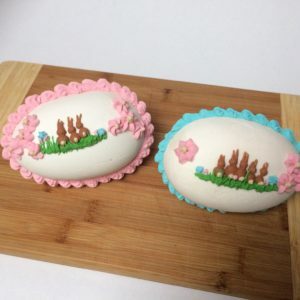 Roll sheets of icing roughly half a centimetre thick, (use icing sugar when rolling, cornflour will make it dry too fast and create a rough surface), cut oval shapes to fit over half an egg-shaped mould that has been dusted with cornflour. Set aside to dry for 24 hours before removing from the moulds. Avoid storing in an airtight container unless completely dry or it will sweat and go soft. Join halves with stiff royal icing, and decorate with more royal icing to cover the joins.